BUFFALO, N.Y. -- University at Buffalo men's tennis senior Petr Vodak was named an ITA Scholar Athlete, the Intercollegiate Tennis Association has announced. Vodak finished with a 3.563 GPA in International Trade, concluding an outstanding two-year career with the Bulls. 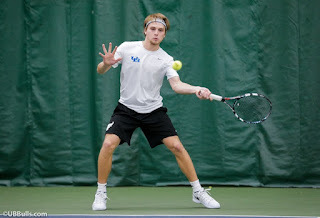 Vodak, who earned the ITA Arthur Ashe Leadership and Sportsmanship Award and was an Academic All-MAC selection, finished the season nationally ranked in doubles as he joined teammate Vidit Vaghela to finish the season 86th. Vodak and Vaghela, who were ranked as high as 64th during the season, finished their final season with a 15-4 record in doubles action, including going 12-4 at first doubles. They won their final ever match together in a 6-3 triumph over Jannik Opitz and Kennosuke Nouchi of Western Michigan in the MAC Championship. Over the course of their record-breaking season, Vaghela and Vodak beat doubles teams from Notre Dame, Harvard, and Columbia, as well as winning the majority of their MAC matches during the regular season, except for two regular season losses to WMU, which they avenged in the MAC Finals.